While the bollard pull test has been around for many decades, recent changes in technique, technology and data-logging allow engineering and operations to fine tune the analysis and provide more accurate information. Providing accurate reports allows pilots, agents and customers to have confidence in towing and tug capabilities at the edge of the performance envelope. While many new tugs are built larger and more powerful than ever before, most of the tugs on rivers and ports have years on their engines and the ability to move their tow when it ultimately matters, should be tested against expectations. Bollard pull is the static force exerted by a tug at zero speed on a fixed line. Almost always, a test involves affixing a line to a shore-based bollard and ramping the RPM’s of the engine to full- throttle, typically in ahead and astern conditions. The vessel is then held at full RPM’s for between 1 and 10 minutes. Some versions of this test are completed quickly and some, like in Brazil, last for over an hour. Many variables can influence a bollard pull test reading, including water depth, prop wash, wind, tidal forces or currents, rudder angle, and stretch of the tow line. Finding an ideal site is difficult, so external forces must be figured into the final analysis. Beyond this, A bollard pull test requires a tension sensor which is put in series with the tow line, a local display of the line tension and a process to record that data. Often, an engineer will be present in the engine room to evaluate engine RPM’s and another engineer will stand on the back deck to track the forces on the load cell by noting them on a display and manually tracking the figures by hand. This process can be challenging and inaccurate in rough weather and in river conditions which change quickly. In river situations, the tug may start upriver of the shore-based bollard, bring the tug up to full power and when the vessel is perpendicular to the shore, the engineer must quickly capture the data from the tension sensor. This short window for readings can make it challenging to capture accurate data. MTNW’s tension monitoring systems include a certified tension link, rugged water proof local display and a laptop PC with data-logging software. The system is plug-and-play for quick set up which allows for more time testing and lower fuel costs. The engineer can now watch the tension locally, but also know that the data-logging software is catching every tension spike for post-test analysis. “MTNW equipment can accommodate tests as simple as full ahead or astern to more complicated tests which seek to correlate line tension to engine RPMs and other variables. The WinchDAC software prints easy-to-read PDFs of each test. 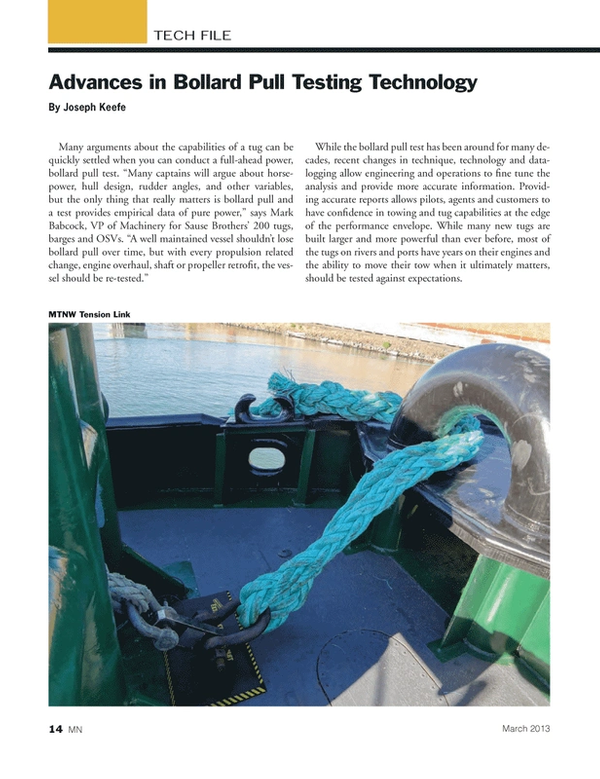 MTNW’s equipment is available for bollard pull testing and certification for tugboats and can be used as a rental device so that more naval architects, tugboat operations managers, and engineers can perform these services on their own. MTNW’s equipment is certified regularly and MTNW will work with certifying witnesses from DNV, ABS, Lloyds, Bureau Veritas and any other required certifying body.